The pots and containers DW Nurseries were using were just not tough enough, hard to mechanize and didn’t produce very good roots. Proptek teamed up with Ellepot USA to discuss and create a solution that is fully mechanizable. Various options were discussed, but it was settled on to use a stabilized media and a tough, air pruning container. Ellepots are an industry leading example of “stabilized media” – where the soil is held together without the need of a tray. If the tray no longer needs to hold the soil in place, a tray or container can then be designed for other purposes. In this case, it was designed to hold all the Ellepots consistently upright and allowing air to flow around the Ellepot “air pruning” all the roots. Also, feet have been added to the tray to provide benching off the ground which allows a consistent and controlled amount of air pruning. All of this air pruning, along the walls as well as the bottom of the Ellepot allows the root ball to heavily produce an aggressive, healthy root structure. A 100mm Ellepot was chosen as the ideal size, which equated to an 8 Cell tray within the 21” x 12” tray. The tray was designed as a two-part growing system – a Sleeve fits into the tray which then holds the tall Ellepot. This also then allows a shorter Ellepot to be used should a crop be grown not needing a taller Ellepot. This has created a system that can be automated in its entirety. 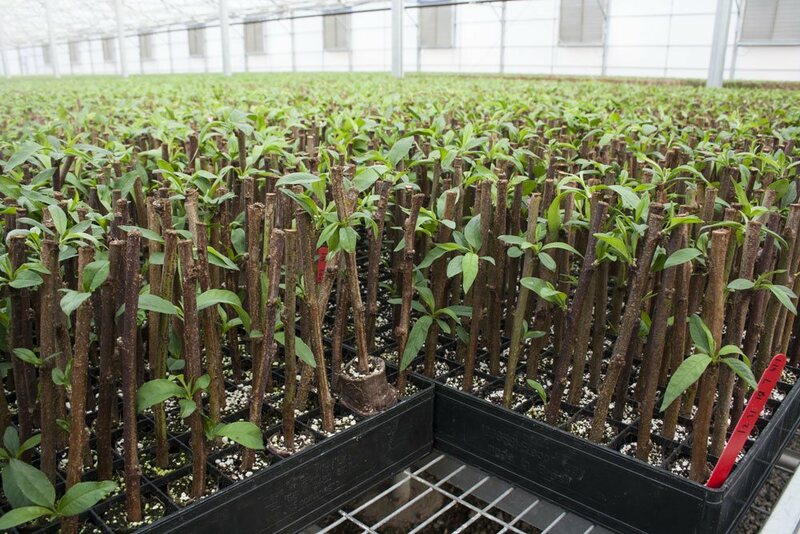 As the life of both the sleeves and trays is very long and produce such excellent results, the increased initial cost for a two-piece growing system is paid for many, many times over the lifetime of the tray. The cuttings used to plant in the 100mm Growing System are started in a 35mm Ellepot. The Proptek 126 tray was selected, as this has the desired spacing, the desired cell volume and holds the Ellepot all the way down the side, meaning it also is secure and stable for mechanization. The 35mm Ellepot can then be removed from the tray, then are easily placed into the 100mm Ellepot, that has been drilled with a 35mm hole by an automated machine. More efficient processes due to mechanization. Better quality roots and plants. A lower mortality rate meaning more plants survive to sell. Overall a better return on investment.